Migg Tweeny: Listen, my name’s Tweeny. The President: You’ll always be sweetheart to me. Migg Tweeny: I know, I know, but there’s talk already. The villainous Mata Machree (based on Garbo’s character from the previous year’s Mata Hari) does a number of serpentine dances and sings a song called, “It’s Terrific (When I Get Hot)” which contains a fair share of suggestive lyrics. She’s also called a ‘cooch dancer’ for what it’s worth. The film’s title really has nothing to do with anything, but certainly sounds evocative. Faster than a speeding bullet! Stronger than a locomotive! Able to leap tall buildings in a secret bound! It’s… George! And George! And yet another George! That’ll have to serve as my silly introduction to you about the silly Million Dollar Legs, the story of an entire nation of super powered misfits named Klopstokia. It’s a small distant country whose chief exports and imports are goats and nuts. A majority of its residents are also listed among the same. 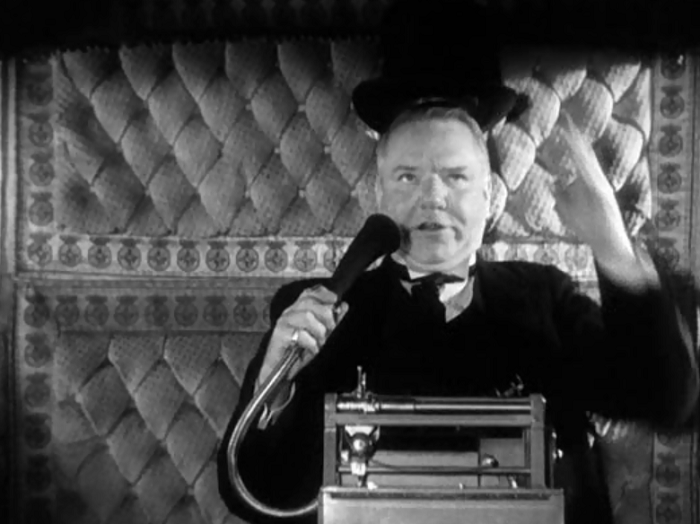 President George (W.C. Fields) is in a bind, since his country is heavily in debt. His cabinet, lead by Secretary of the Treasury George (Hugh Herbert) is out to get him, employing spies and deceit of all sort to undermine him. Of course, the presidency of Klopstokia is actually determined by arm wrestling, which may also be hindering the political infrastructure. Thankfully master salesman Migg Tweeney comes to the rescue; it’s mostly out of a deep affection for the president’s daughter, Angela, than anything. (Oh, and every woman in Klopstokia is named Angela. That’s important to know too.) Tweeney’s plan involves getting a sponsorship deal if the super powered country can sweep the 1932 Olympics in Los Angeles. That’s a pretty loose description for a pretty loose movie. Million Dollar Legs traffics in cartoon insanity– in fact, I’m pretty sure I’ve seen a number of the film’s gags resurface years later in Looney Tunes and other abstract stabs at comedy. It’s a film that goes for broke with its humor, offering up punchlines every few second. In this attempt, sometimes things get weird beyond measure– a palace messenger chases Migg and Angela across several miles while dressed as a goat at super speed. Another time a brief walk in the woods between the romantic couple results in them leaning on the wrong rock and being dropped down into the villain’s lair via elevator/palm tree. 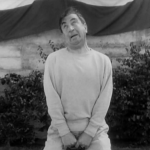 Like a number of Paramount comedies from this era, the finished film gives off the feeling that a few things got lost along the way, either from desperate editing or slipshod censorship somewhere down the line. Migg’s valuable pocket watch ends up smashed under a giant weight with no explanation or reaction from him. 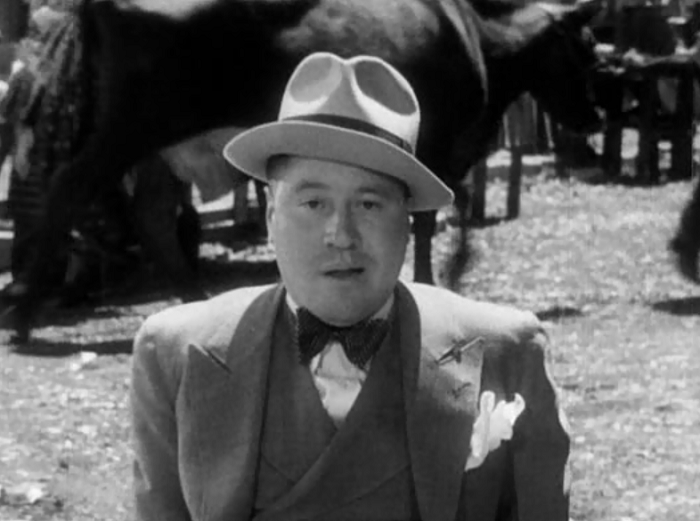 The Mysterious Man, who doesn’t seem to be spying for anyone in particular, disappears about halfway into the film. But bits like that only add to the surreal atmosphere of the film, which defies manners for most of its run. 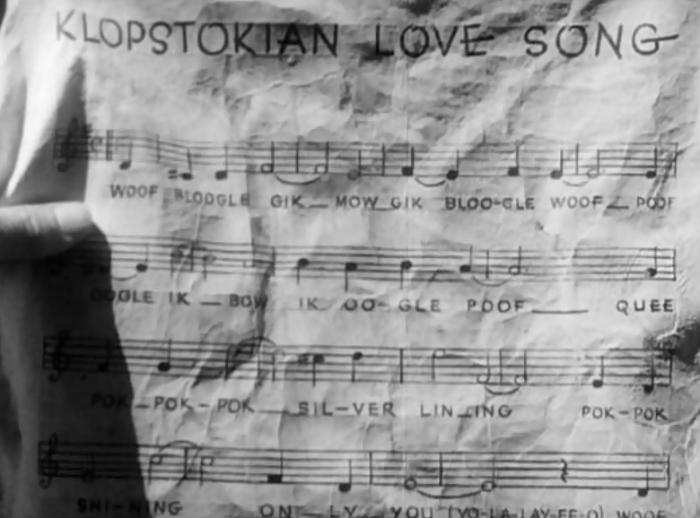 The best part may be the Klopstokian love ballad that Migg sings to Angela, the tune of “One Hour with You” (from the Paramount production One Hour with You) replaced with nonsense lyrics. Jack Oakie sings the words “im ploogle gig” with such loving and affection he puts many of the crooners of the era to shame. Oakie is in fine form, taking his usual enthusiastic go-getter character and putting him in one of the wackier fish out of water scenarios out there. His measured reaction to this insanity makes the movie work better than it has any right to. Fields, in one of his first sound features, is rather surprising. His health conscience super-strong Pres is the opposite of his usual womanizing, drunk persona. It’s a delight not only to see him play against type, but to also think himself the rock of sanity when he is in reality the head inmate of the asylum. (It should be noted that I’m probably the only person in the world who prefers Oakie’s comedic stylings over Fields’ usual work.) 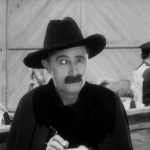 There’s also a deep comedic supporting cast culled from silents and talkies, from the masterfully blubbering Hugh Herbert to stiff faced Andy Clyde. Hell, even child actor Dickie Moore is funny. Double hell, that robe is funny. While there are elements of political satire to the film, it rarely reaches the same heights as the 1933 films Duck Soupor Diplomaniacs. The few points that are there are nicely made at least: just because the strongest are in power, that doesn’t make them the smartest. A country will exploit whatever resources it has to its own benefit– and work against itself if the opportunities are there as well. Also, goat milk is delicious and good for you. Don’t discount that. Million Dollar Legs is a lunatic lark, the story of a misfit country that succeeds on the world stage because of sheer luck and inventiveness. Even if Klopstokia isn’t the U.S., I think there’s more than a fair bit of the U.S. in Klopstokia, then and now. The movie opened two weeks before the 1932 Los Angeles Olympics in hopes of capitalizing on it. Also set during the Olympics is the otherwise unrelated but also utterly daffy Search for Beauty. 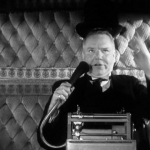 TCMDB notes that W.C. Fields insisted on improvising most of his role. 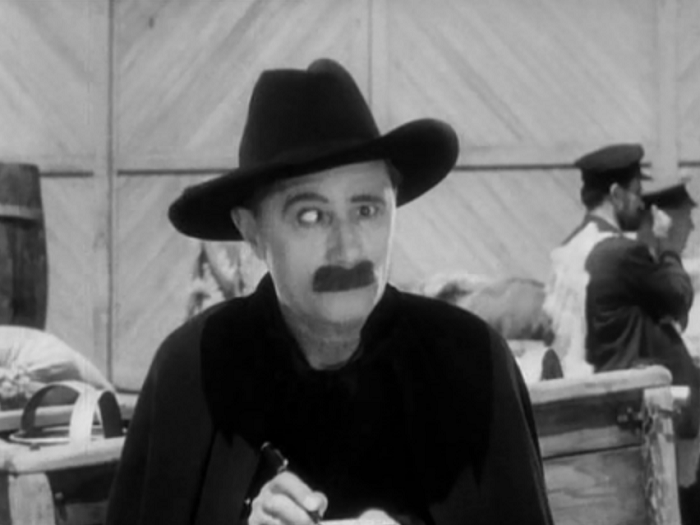 Fields was famous for copyrighting a lot of his material in hopes of dissuading copycats, and apparently bought the rights to his work in this film for a total of $.50. 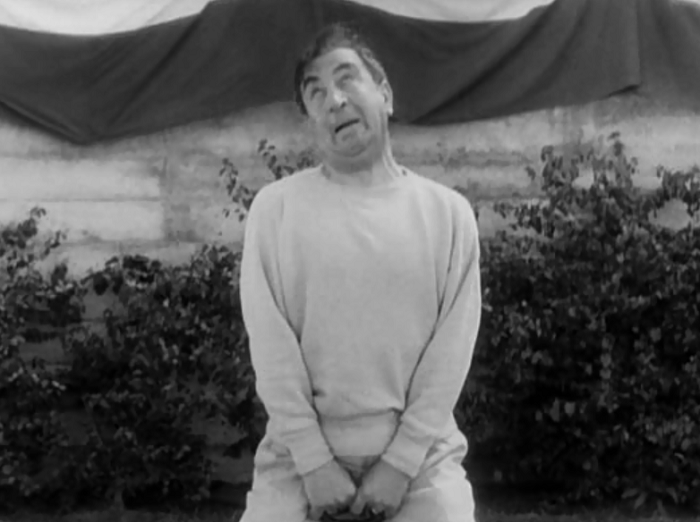 Paramount had felt that he wasn’t big enough to be given a starring role yet, and this movie was a field test for that. Gonna sing this one to my wife tonight. A Trip Down Memory Lane recounts the remarkably short life and career of Lyda Roberti, a Polish emigrant most famous for this movie and Eddie Cantor’s The Kid from Spain. She passed away in 1938 from a heart attack at the age of 31. FilmFanatic.Org is into this one and notes its place in Fields’ filmography. This film is available in the Universal Rarities set along with Belle of the Nineties. You can pick it up on Amazon or at the TCM site. … you weren’t aware that Susan Fleming (leading lady Angela) left performing when she married Harpo Marx? Uniquely among all the Marx Bros. marriages, Harpo and Susan’s was the only long-running happy one (and not just because it was the only one that didn’t end in divorce). I saw this pic on TV when I was a teenager, and always wondered why Susan Fleming didn’t become a bigger star; I only learned of the Harpo connection years later. I will admit I left that out because I kind of felt bad about it. 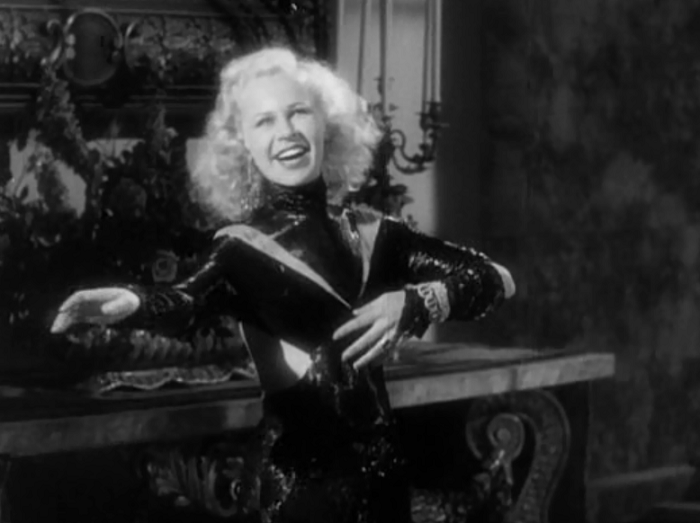 Her performance is great, but every time I write about Harpo, do I mention Susan Fleming? It’s true that her biggest claim to fame is her more famous husband (and the wonderful marriage that they seemed to have had), but I felt like I just wanted to give her a shining moment on her own. It’s weird to do in retrospect, I will admit that. 1. Surrealist humor is a style close to my heart, so I love this movie. I showed it in one of my classes once and it brought the house down. 3. 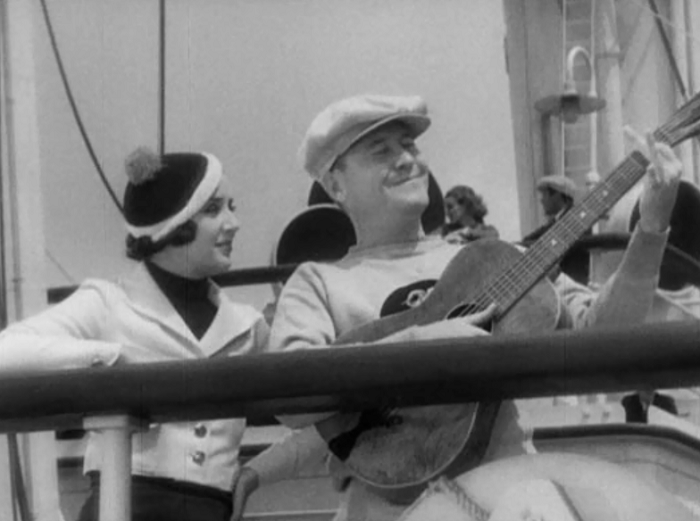 Fields’ first sound feature was “Her Majesty, Love” a year earlier. But since you’re not a fan of his (*GASP*), I’m not surprised at the mistake. Just LOVE this movie. It’s probably the closest thing to Dada and Surrealism that Hollywood ever got (except for Fields’ short sound film, The Fatal Glass of Beer, which is probably the funniest 20 minutes ever committed to celluloid). 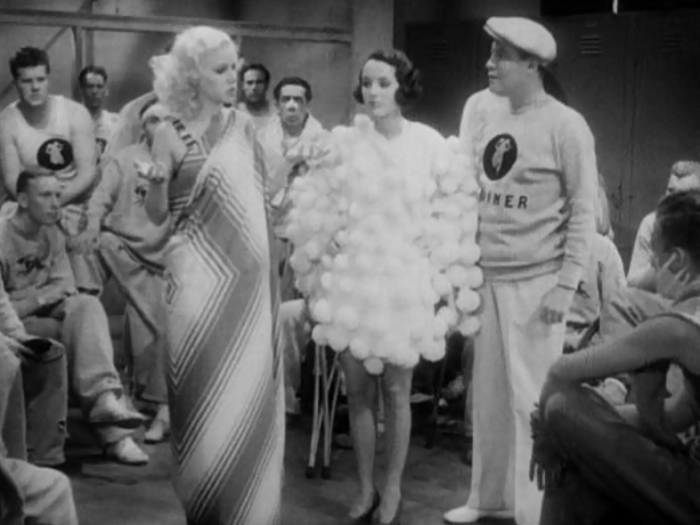 Susan Fleming was married to Harpo Marx; her deadpan delivery really makes this movie (don’t know if there’s a connection there). It really is worth noting that just how Fleming’s ability to sell Klopstokia as a serious entity makes the movie work. My family had a number of exchange students stay with us, often filled with questions about why Americans do something a certain way, and the only possible response is a straight faced, “Well, of course we do it that way. Why would anyone do it any way else?” Fleming captures that perfectly. That’s a great observation about her. 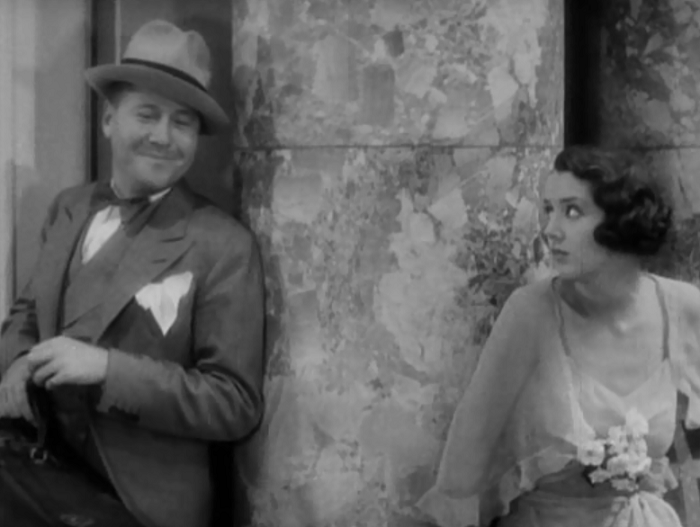 My favorite line of hers in the film is when Oakie asks why all men and women are named George and Angela, and she deadpan replies, “Why not?” Klopstockia in a nutshell (no pun intended). What makes a movie hard to find? I should think a wonderful comedy would be much more popular still. 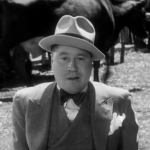 I agree, but I’m afraid that Jack Oakie would probably fall in the ‘hardly remembered’ category of leading men. The disc was released in the handsome Universal Rarities collection, but that creates a problem for people who are only interested in Million Dollar Legs: why do they have to put $40 down for something they love just to get three movies they may be indifferent on? I hope it’ll get an individual release someday (if only to save more people from Belle of the Nineties), but as for right now such a set is a good idea for Universal. By being able to charge a relatively high amount of money for a DVD nowadays, it helps offset the cost in restoring all of the features contained. Since they’re only releasing it through TCM, too, they’re making sure they can set that price and make the money back they need to on the restorations. Ha! It’s okay, May. Fields is an acquired taste, and I think it’ll be a long time before I acquire that myself. I was reading the other day that originally Road to Singapore was to star Fred MacMurray and Jack Oakey rather than Hope and Crosby, and now I wonder how that series would have turned out. 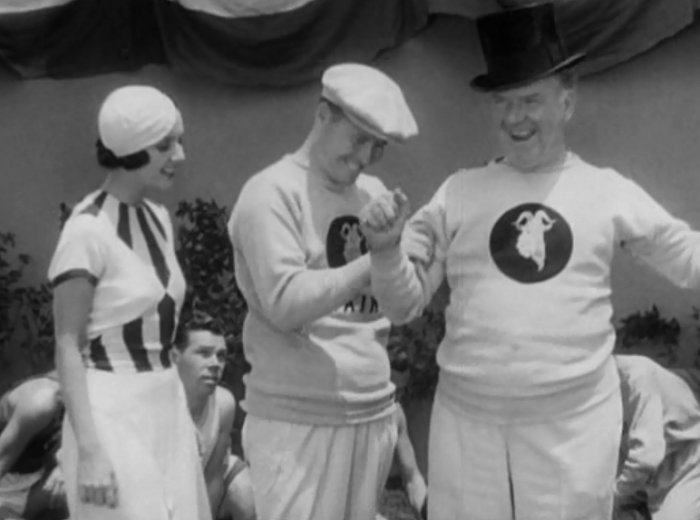 Hate to do this to you, but “Million Dollar Legs” was NOT W. C. Fields’ first talking feature. That was “Her Majesty, Love” with Marilyn Miller and Ben Lyon, made at Warner Bros. in 1931. It’s still a great movie, though, and Lyda Roberti’s Garbo parody is especially surreal: a Polish actress ridiculing a Swedish one in her role as a Dutch woman who pretended to be East Indian or Polynesian! I just watched this as part of my ‘things referenced in the League of Extraordinary Gentlemen comics’ reading list (mostly reading 😉 ) . I thought it was quite painful to watch at the start but really grew on me after about 20mins or so. Reference: “Migg’s valuable pocket watch ends up smashed under a giant weight with no explanation or reaction from him.” You need to watch it again. The reason that Migg Tweeney doesn’t react is because it isn’t his watch. It’s a stopwatch being used by the referee who had just said that the weight being lifted by WC Fields isn’t off the ground (from where he’s looking). The ref’s arms gets bumped by Miggs and his watch is under the weight when the Prez drops it. The fact it’s crushed proving that the weight was indeed off the ground. As a present day screenwriter and comedy writer, your analysis, for the most part, works for me. The mention of Dadaism and surrealism associated with this film, which were prevalent creative concepts at the time (and tagged to THE FATAL GLASS OF BEER as well by Grand Old Films) hits the mark. This film and “…FATAL GLASS” look like a creative filmic foray into avantgarde thinking at the time. Your criticism about not resolving the spying issue, which to me is an unforgiveable scriptwriters sin, rings right. I strongly disagree with your preference for Oakey over Fields, notwithstanding my personal prejudice.